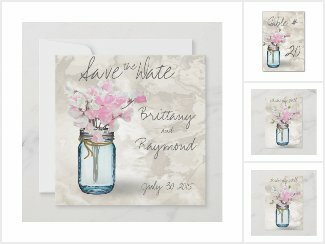 for your Garden Wedding Invitations – Vintage blue mason jar tied with a jute twine and a bouquet of pretty sweet pea flowers in pastel shades of cream and pink. A sand colored watercolor background offers a vintage feel. © 2015 Original watercolor painting by WhimsicalArtwork™ Perfect for that country wedding or vintage party. Romantic Shabby Chic Sweet Pea Wedding features wedding suite by The Barefoot Bride. Vintage blue mason jar tied with a jute twine and a bouquet of pretty sweet pea flowers in pastel shades of cream and pink. A sand colored watercolor background offers a vintage feel.